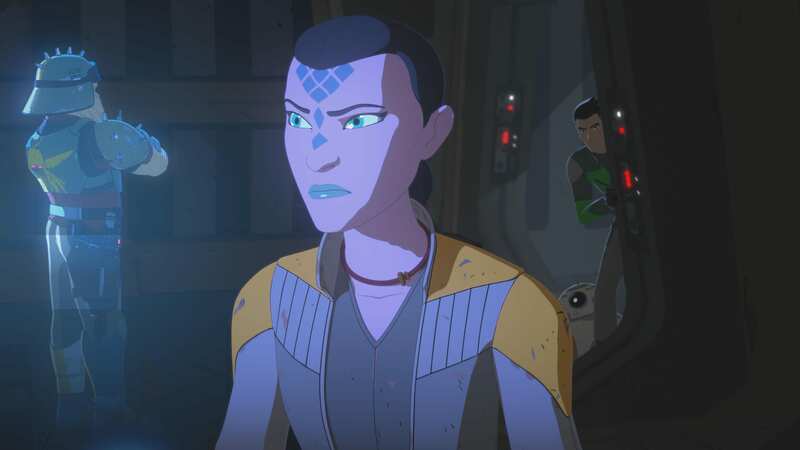 This week on Star Wars Resistance, Synara discovers that the First Order is locking down the station as they search for a spy. The stormtroopers try to arrest an innocent man who can’t provide identification, but Kaz and Neeku distract them until he finds his ID. Kaz wants to tell Poe about what’s happening at the Colossus, but Yeager forbids it, saying it would out Kaz as a spy. The First Order could too easily intercept such a message, so he needs to wait until he hears from Poe. Stormtroopers arrive to interrogate Kaz, and both he and Yeager play dumb. They say they’re also looking for Synara and head out. Kaz follows Synara to warn her, and she has a meeting with her boss, who says she needs to find a way off the platform if she wants to be picked up. Kaz catches up with Synara and tries to subtly tell her he knows she’s a spy and that the First Order is after her. Kaz pushes a cart with Synara inside, smuggling her toward a cargo transport. He tells Synara that, regardless of her being a spy, he knows she’s a good person. He instructs BB-8 to override the vehicle’s security protocols; the droid does so, and Synara jumps in. However, Kaz is spotted by the Stormtroopers, who pursue him and BB-8. Synara sees this, knocks the troopers out, and tells Kaz to come with her. However, when they get back, the ships are already leaving. They go back to Yeager’s shop and ask Neeku for help. He tells them that there are underwater escape pods they can use. While they head for the pods, Neeku and BB-8 distract the troops. Synara thanks Kaz for the first time just as he puts her in one of the pods, sending her to safety. She sends Kregin, her boss, the coordinates to her location. Back at Yeager’s shop, Tam wonders why Synara would be uncomfortable with the First Order around, remarking that they’re just protecting the platform. Neeku arrives back exhausted and passes out. Kregin and the pirates finally arrive and pick up Synara. “The First Order Occupation” is very much in line with “The Doza Dilemma” in terms of characters and story. Again, they actually managed to get me invested in Synara and her fate. Kaz also isn’t as dumb or annoying as usual, and I find it commendable that he’d do all this to help a friend even given the betrayal he must feel. The animation on Synara’s face when Kregin picks her up, as well as Nazneen Contractor’s vocal performance here and throughout the episode, really help to elevate the material. It strikes me as odd that it’s taken the Resistance crew what must be two-thirds of a season to really get the show in gear. I’m starting to like some of the characters and genuinely want to know how the story will play out, but if the show had started out even mediocre and had better animation, I’d care more and feel less ambivalent. Neeku’s constant confusion at slang and figures of speech is still annoying in “The First Order Occupation,” but he’s far from being the main focus and serves a purpose in the story. Yeager’s couple of appearances are pretty good, as usual, and while he’s right about Kaz needing to lay low, for once it doesn’t feel totally one-sided; Kaz is trying to help a friend and inform his friends in the Resistance that the Colossus is being occupied. It would be unwise to contact Poe, but it’s an understandable impulse. They also continue to layer on moral complexity with the First Order and how different people view the occupation. Tam thinks it’s good that they’re on the Colossus, and is puzzled by Synara’s decision to leave and Kazuda’s criticisms of them. Even in the face of unfair interrogations and arrests, Tam insists that they’re just doing their job to protect the people. I still wish we knew more about the First Order, and that they were a more imposing threat. Neeku’s throwaway line about the Empire emphasizes the main problem with the First Order: they’re a lame copy of the Empire, but less threatening and less interesting. The First Order uses the imagery of the Empire as narrative shorthand in the same way that the Empire used Nazi imagery to convey something to the audience, but that doesn’t work. We’ve already had the Empire, and a copy of a copy of a copy becomes increasingly diluted until it’s lost all meaning and relevance. We’re there with the First Order, and since the movies won’t do it, I hope this series will eventually define them as an organization with beliefs and priorities, as well as make them a real threat. The show’s original music by Michael Tavera is back on form in “The First Order Occupation,” and I particularly enjoyed the track when Kaz and Synara are trying to avoid the troopers. The animation continues to be cheap and ugly, but I appreciate the focus on facial expressions. Even the vocal performances seem to be improving. The dialogue is still terrible at times, but I do find myself cringing and rolling my eyes less. Overall, it seems like effort is finally being put into Resistance after all, and it’s slowly paying off. Dare I say it, future seasons might actually be good. Resistance started off much worse than Clone Wars or Rebels, but it may just get there. “The First Order Occupation” is not a bad episode. In fact, it’s pretty good. There are definitely stupid moments and bad lines of dialogue, and the animation still looks like hideous goop. However, the story, characters, and overall tone of the series are developing into something worth a look. Resistance is still not what I’d call a good show, but this is the first time I’ve thought it might be eventually. “The First Order Occupation” is the first episode I would call more good than bad. I’m genuinely curious to see what they do with Kaz and, particularly, Synara from here, as well as whether they choose to develop the First Order at all. Star Wars Resistance - "The First Order Occupation"
“The First Order Occupation” is not a bad episode. In fact, it’s pretty good. There are definitely stupid moments and bad lines of dialogue, and the animation still looks like hideous goop. However, the story, characters, and overall tone of the series is developing into something worth a look.